Democrat Kyrsten Sinema flipped into the lead over Republican Martha McSally late Thursday as votes are still being counted in several counties. McSally had held the lead early Thursday, two days after the Tuesday midterm election. She had 49.4 percent and 856,848 votes. Sinema had 48.4 percent at 839,775 votes at the time. At the time there were still 617,000 votes to be counted in the state or 16 percent of all votes cast, according to the Arizona Secretary of State. 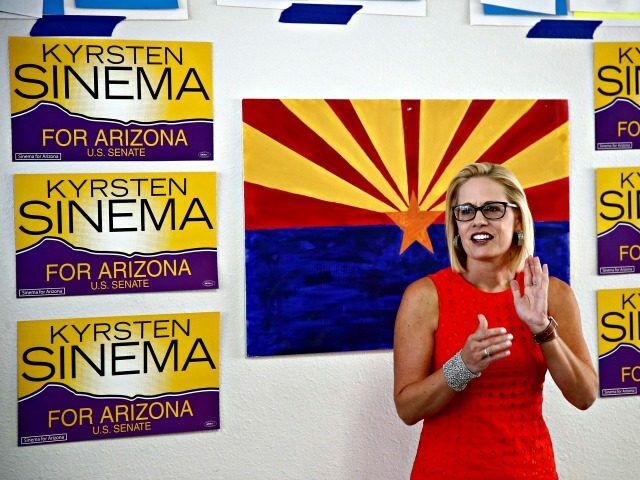 That lead flipped late Thursday with an updated batch of votes counted putting Sinema in the lead with 49.1 percent of the vote, or 932,870 votes. McSally dipped to 48.59 percent of the vote with 923,260 votes. Green Party candidate Angela Green had carved out a slim 2.31 percent of the vote with 43,838 votes. The 1,899,968 total votes counted as of late Thursday’s posting represented 99 percent reporting or 1,484 of 1,489 precincts, according to the New York Times. Latest numbers from the Arizona Secretary of State as reported by the Arizona Republicshow Maricopa County with 345,000 votes yet to be counted (150,000 early ballots, 195,000 Election Day drop-off, provisional, or out-of-precinct ballots), Pima County with 54,000 yet to be counted (36,000 early and 18,000 provisional ballots), Pinal County with 31,800 early ballots yet to be counted, and Coconino County with 10,600 votes remaining to be counted. There are small batches of votes yet to be counted in other counties as well: Mohave County 8,000, Santa Cruz County 6,100, Yavapai County 6,100, Apache County 4,600, Navajo County 4,000, Yuma County 3,100, Cochise County 1,700, and La Paz County 580. Republicans have already secured continued control of the U.S. Senate after Tuesday’s midterm election results, gaining seats in the Senate regardless of whether McSally or Sinema emerge victorious in the Arizona race.